Yanko Design: "A close brush with a distracted driver is enough to intimidate any avid bicycler from riding at night. You’ve probably seen small blinkers and flashers tucked just below the seat but that isn’t enough. As a daily driver in a very bike friendly city, I can attest I usually don’t notice those blinkers until I’m within a few hundred yards of the bicycler. That leaves very little distance and time to react if I were to collide with them. Only a small fraction of streets have dedicated bike lanes, and with an installation cost of $5,000 - $50,000 per mile, we shouldn’t expect to find them everywhere anytime soon. 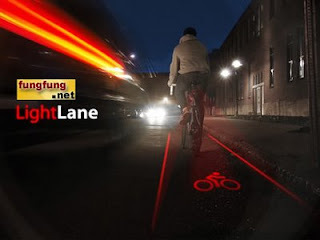 LightLane projects a crisply defined virtual bike lane onto pavement, using a laser, providing the driver with a familiar boundary to avoid. With a wider margin of safety, bikers will regain their confidence to ride at night, making the bike a more viable commuting alternative. I want one now. Evan and Alex, make it and call me!" FF: "It's useful, 5D make it and sell it @ my online store"
Yanko Design: "We need to get innovative with the way we display our feelings. Leaving Post-its or texting is getting a bit outdated don’t you think? The classic is of course; leaving a message on the fogged-up bathroom mirror, but that is about to get superceded with the Daywriter, Nightwriter. Both of them are essentially elongated three-dimensional scratchboards that you can use to write messages on. 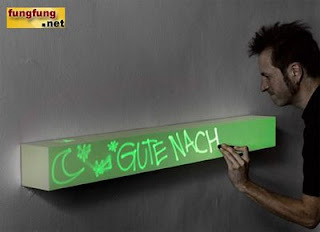 Touting itself as the world’s first interactive furniture, the Daywriter (as the name suggests) is used for displaying messages during the day. But the story gets brighter with the Nightwriter. This one is like a florescent glow-in-the-dark type of board. Scratch on the words and watch them glow! Naturally you can erase all your messages and get creative everyday." FF: "Its easy to use, looking gd, i sud sell this @ my online store"